Media coverage of the Boston Marathon bombings of April 15, 2013, displayed all of the growing pains of a still-evolving digital world that allows both for the virtues of hyper-connected speed and the perils of unconfirmed reports and social media’s raw, unfiltered broadcast capacity. Subsequent reporting has also been marred by false reports and information. The Nieman Journalism Lab has rounded up many of the significant pieces of media criticism published in the wake of the incident. The delicate interplay between speed and accuracy has always been a professional and ethical issue for journalists, but observers saw new dynamics emerging on April 15, with some on Twitter urging restraint and caution, and fighting against the instinct to retweet the latest rumor. A new paper from the Harvard Kennedy School, “Preliminary Thoughts and Observations on the Boston Marathon Bombings,” examines a number of lessons learned in terms of preparedness, safety, public and government responses, and leadership. Some core principles can help guide coverage of disaster, terrorism and public health emergencies, beginning with the Society of Professional Journalists’ “Code of Ethics,” which states at the top that reporters should: “Test the accuracy of information from all sources and exercise care to avoid inadvertent error. Deliberate distortion is never permissible.” Advice more specific to the Boston Marathon attack is provided in detail at the Dart Center for Journalism and Trauma. The Poynter Institute is also offering tips that should guide further coverage of the bombing. The philosophical split you are seeing here is people that think anything that is a rumor or not confirmed should be hidden in the deepest depths of the newsroom until it is verified, versus what I do, which is acknowledging that certain things are already out there being discussed by the public, and in many cases by the media, and I ask for additional sourcing. And some people don’t like that. Many news organizations are now struggling to figure out if there should be uniform standards across platforms — if “live blogs” and reporters on Twitter should follow the precise standards guiding what would be said in a television broadcast or written in an article on the front page. Jeremy Stahl, Slate‘s social media editor, offers further thoughts on Boston-related coverage and “tweeting during a crisis.” Hong Qu at Nieman Journalism Lab provides play-by-play analysis of breaking news and examines lessons learned as events unfolded on April 15. Report from the National Consortium for the Study of Terrorism and Responses to Terrorism (START), University of Maryland, February 2012. Excerpt: “START and the Global Terrorism Database, on which the Report is based, defines terrorism and terrorist attacks as ‘the threatened or actual use of illegal force and violence by a non-state actor to attain a political, economic, religious, or social goal through fear, coercion, or intimidation’…. We ask whether certain U.S. counties act as hot spots for terrorist attacks. 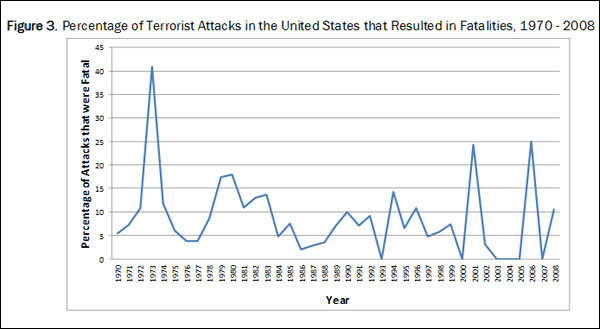 More than 2,600 terrorist events occurred in the United States between 1970 and 2008. Following past criminological practice, we define hot spots of terrorist attacks as areas experiencing more than the average number of events. While there is evidence of the geographic concentration of terrorist attacks in particular counties (hot spots of terrorist attacks), the data also show that terrorism is widely dispersed, occurring in every state in the country. In total, 65 counties (out of a total of 3,143 U.S. counties) were identified as hot spots of terrorist attacks. While many of these were large, urban city centers (Manhattan, Los Angeles, Miami Dade, San Francisco, Washington DC), terrorist events also cluster in small, more rural counties as well (e.g., Maricopa County, AZ; Middlesex County, MA; Dakota County, NE; Harris County, TX). While the overall percentage of terrorist attacks that result in fatalities is low, the geographic distribution of these events remained similar with large urban centers predominating and yet a good deal of activity in smaller areas as well…. Zelin, Aaron. New America Foundation report, January 2013. Report from the Majority and Minority Staff, Senate Committee on Homeland Security and Governmental Affairs, February 2012. James A. Baker III Institute for Public Policy at Rice University, 2012. Triangle Center on Terrorism and Homeland Security, University of Chapel Hill, February 2013. Studies in Conflict & Terrorism, Vol. 35, Issue 12, 2012. Evidence-Based Counterterrorism Policy, Vol. 3, 2012. University of Essex, United Kingdom, September 2012. Journal of Strategic Security, Vol. 5, 2012. B.E. Journal of Economic Analysis & Policy, December 2012. Criminal Justice Policy Review, Vol. 23, No. 3, September 2012. Crime & Deliquency, Vol. 58, No. 5, September 2012.